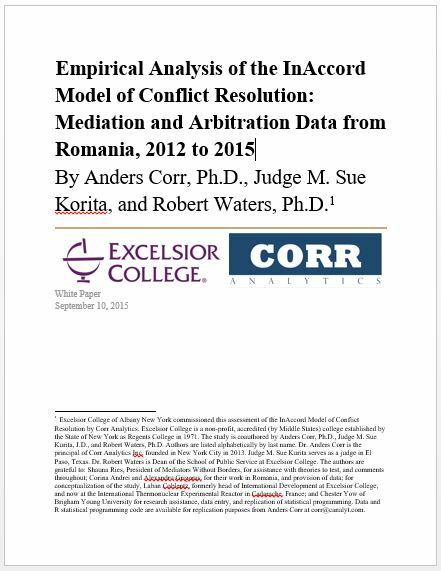 Mediation and Arbitration | Corr Analytics Inc.
Cover-page of the white paper, “Empirical Analysis of the InAccord Model of Conflict Resolution”, published by Excelsior College and Corr Analytics on September 12, 2015. Empirical Analysis of the InAccord Model. Corr Kurita Waters. Sept 10 2015 v4. 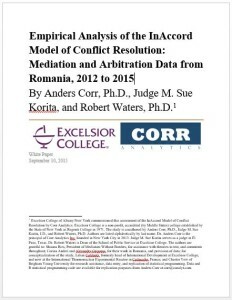 The title of the paper, published on September 9, 2015, is “Empirical Analysis of the InAccord Model of Conflict Resolution: Mediation and Arbitration Data from Romania, 2012 to 2015”, authored by by Anders Corr, Ph.D., Judge M. Sue Korita, and Robert Waters, Ph.D. The paper is summarized below. The InAccord model of conflict resolution was developed in Boulder, Colorado by Mediators Without Borders, starting in 1994. The following principles form the theoretical foundation of the model: conflict is normal, inevitable, and workable; disputants should be empowered to work successfully with conflict; empowerment derives from transparency, reflecting, reframing, and questioning; and disputants create enduring solutions through exploration of their emotions. Mediators Without Borders has implemented the InAccord model in the United States, Brazil, Nigeria, Romania, the Bahamas, Italy, France, Switzerland, UK, Japan, Hungary, Ethiopia, and Germany. Our quantitative empirical analysis of mediation data, collected by an InAccord practitioner in Romania from 2012 to 2015, uses multivariate quasibinomial logit regression, multiple imputation, and maximum likelihood methods. We find significant positive correlations between understanding of the model among 29 disputants (n=29), and their feelings of empowerment after participating in the InAccord process. The mean change in empowering feelings (forgiveness, peace, happiness, gratitude, empathy, and hopefulness) is 0.17 (σ=1.24) per feeling, per disputant. In other words, disputants improved by an average of 0.17 points on a 1-4 scale for each empowerment feeling singly, with a standard deviation of all empowering changes of σ=1.27. Disempowering feelings (anger, guilt, anxiety, depression, fear, and humiliation) decreased by an average of 0.33 (σ=0.80) per feeling, per disputant. Summing the absolute value of all changes per each of 29 individuals showed a mean improvement across all feelings of 3.00 (σ=7.76) per disputant. While these results are not significantly different from zero change from a Bayesian perspective, due to a limited number of observations, they do show maximum likelihood improvement. We utilized: multiple imputation to estimate missing data, as well as maximum likelihood, quasibinomial logit regression, and other quantitative methods of causal inference. A simple linear regression of the variable “Understanding InAccord Techniques”, which ranges from 1 to 4, on “Total Feeling Change”, which has a theoretical range of -36 to +36 (12 feelings multiplied by 3 point changes in either a positive or negative direction) , shows that for every one point improvement on understanding InAccord techniques, total feelings are predicted to improve 6.67 (σ 2.26) points over the course of the mediation, a statistically significant result. We are confident that improving understanding of InAccord techniques from the minimum to the maximum level (a change of 3 points) predicts a 20-point improvement in feelings of disputants, a good indicator of resolution success resulting from the InAccord process.